The neoliberal approach to economic growth of the past forty years has been to drive down real wages, deregulate the financial sector, privatize various government functions, cut social expenditures and reduce taxes on large corporations and the wealthy. The period has been characterized by sluggish growth and widening inequalities. In contrast, the markedly higher rates of growth achieved from the end of the Second World War until the early 1970s were sustained in a regime of steadily rising real wages, which were consciously linked through policy or collective bargaining to improvements in productivity. This approach to industrial relations was played out within a context of substantial direct public-sector involvement in the economy, tight financial regulation, high and steeply progressive taxation and a more equal distribution of income and wealth. A similar pattern is discernible in communist and former communist countries. The Soviet Union achieved strong rates of growth in the period 1950-73 and then fared increasingly poorly over the period of “reform”, especially from 1985 onwards (Mazat and Serrano provide a recent study). The subsequent transition to capitalism and extreme application of neoliberal policy prescriptions resulted in an economic disaster that persists to this day in many parts of Eastern Europe. In Asia, of course, we see the strong growth record of state-dominated China, which is yet to embrace the neoliberal dogma. With this broad historical comparison in mind, it is perhaps worth considering the role of government spending in fostering a high-wage, demand-led growth regime. In this expression, P is total profit before its distribution into retained earnings, dividends, rent, interest and so on. Suppose, initially, that the normal output-to-capital ratio Θ and the profit share in income π are constant for some duration of time. Under these circumstances, it is clear that the actual rate of profit will rise and fall with capacity utilization u. The ‘accelerator principle’ suggests that extra private investment tends to be induced when demand-determined levels of economic activity test the limits of productive capacity. In envisaging this process, it is assumed that there are untapped resources, including an excess supply of unemployed and underemployed labor, that makes it possible to adjust capacity to demand in this way. Capitalism itself tends to reproduce this excess supply of labor through technical innovations. More specifically, investment will be induced via an accelerator mechanism when demand pushes output and the rate of capacity utilization above ‘normal’. By ‘normal’ is meant the average level at which firms expect to operate their capacity over the life of plant and equipment, allowing for fluctuations in demand. For present purposes, the normal rate of capacity utilization can be considered to occur when Y = Yn or, equivalently, u = 1. Firms normally intend to operate with a planned degree of spare capacity. This enables them to respond to unexpected peaks in demand without losing market share. This means that Yn will be somewhat below the maximum level of output made possible with the existing capital stock. For the US, utilization rates, as a percentage of absolute capacity, have ranged from a low of 66.7 percent to a high of 89.4 percent since records began to be kept in 1967. This reinforces the view that the economy is normally constrained by demand, well inside ultimate supply limits. In light of the US experience, it may be helpful, by way of a mental picture, to think of normal utilization, where u = 1, as occurring somewhere around 80 percent utilization of absolute capacity. That would mean absolute capacity corresponded to a utilization rate of around 1.25. In other words, u (in the way it is defined here) will frequently exceed 1. In accordance with the accelerator principle, when demand persistently maintains output above the normal planned level (implying u > 1), this will tend to induce additional investment by firms in an effort to adjust normal capacity output Yn to demand, or, in other words, to restore the utilization rate approximately to 1. Although under the accelerator principle investment is induced by demand, this behavioral assumption is, in a restricted sense, consistent with the idea of a positive relationship between investment and the actual rate of profit applying to the economy on average. It is just that this positive relationship holds only within the context of a particular ‘distribution’ (profit share in income) and ‘technology’ (normal output-to-capital ratio). Also, it is the rise in demand and subsequent higher rate of capacity utilization that is depicted as causing the increase in the actual rate of profit. This works through an expansion of employment. Causation runs from (a) expected final demand to (b) planned output to (c) a derived demand for labor power and inputs to (d) the performance of living labor and creation of value (as well as the transfer to final output of the preexisting value of inputs) to (e) an adjustment of actual output to demand to (f) a change in capacity utilization to (g) a change in the actual rate of profit. The relationship between investment driven by an accelerator mechanism and the expected rate of profit can be somewhat different, depending on what time frame we have in mind. At one extreme, short-term expectations are likely to follow recent behavior of the actual rate of profit. At the other extreme, firms, in the very long run, will expect the average rate of utilization to be normal (u = 1). 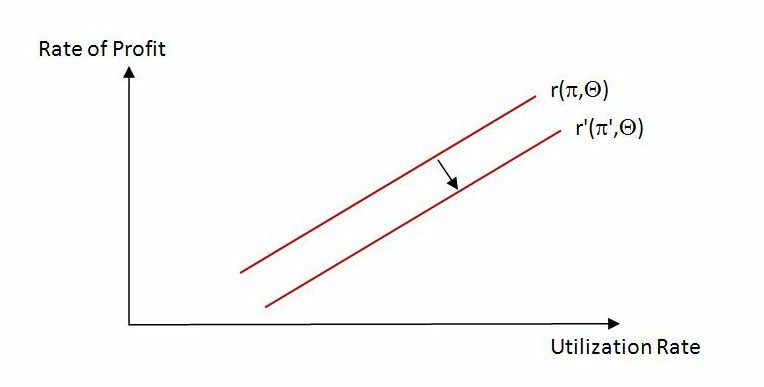 The expected rate of profit will then reduce to re = πΘ, with the expected rate of profit reflecting the anticipated long-run behavior of distribution (π) and technology (Θ). Within a stable institutional setting, the expected rate of profit over a long time frame might change only slowly in line with gradual, anticipated changes in the profit share and normal output-to-capital ratio. Between these two extremes is an intermediate time frame in which firms might expect utilization to remain persistently above or persistently below normal for quite some time, perhaps because the economy is perceived to be transitioning from a low to high trend growth rate, or vice versa. If so, the actual rate of profit will fluctuate during the transitional phase around a medium-term average that differs from the rate associated with u = 1. In terms of investment, the appropriate time frame is the expected life of the plant and equipment to be installed. This suggests a fairly long time horizon for most physical items and perhaps a medium-term outlook for software. Suppose, still holding technology Θ constant, that there is an exogenous reduction in the profit share π. One way to think of the effect of this is that it will lower the range of profit rates to be delivered by variations in capacity utilization u. So long as the new distribution holds, rates of profit and capacity utilization will rise and fall together. But, for any given rate of utilization, the rate of profit will be lower than it would have been before the change in distribution. What is the effect of the distributional change on demand and capacity utilization? Will a persistently high rate of capacity utilization induce investment just as reliably in a low-profit regime as it would in a high-profit regime? From the perspective of Marx, the second question could similarly be posed in relation to the normal output-to-capital ratio Θ. If, as Marx argued, there is a tendency for the organic composition of capital to rise during an extended period of accumulation, this would imply (for a given rate of surplus value) a falling normal output-to-capital ratio over a persistent growth phase. A study by Andrew Kliman (2011, The Failure of Capitalist Production, Pluto Press, London, p. 133) suggests that the organic composition has risen in the US economy by about 1.5-1.7 percent a year since the Second World War. If so, this will have had a dampening effect on the rate of profit. Here, too, it is relevant to ask whether high rates of capacity utilization (and so relatively high rates of profit within a low profit-rate regime) will be enough to induce private investment. Kalecki offered one possible framework for thinking about the impact of distribution on income growth and hence rates of capacity utilization. Assume that workers, in aggregate, consume an amount equal to their wages and that demand can be fully met at current capacity due to the intentional maintenance of spare capacity and presence of underemployed and unemployed workers. Suppose, also, that the economy comprises three ‘departments’. Department 1 produces ‘investment goods’. Department 2 produces ‘luxury goods’ for capitalist consumption. And department 3 produces consumption goods (or ‘wage goods’) for workers. Kalecki pointed out that if we imagine an all-round (i.e. global) increase in wages with no initial change in prices or investment, the effect would be temporarily to raise the profits of firms supplying wage goods while causing an exactly offsetting fall in the profits of firms producing investment and luxury goods. The reason for this is that the profit of the wage-goods sector is equal to the consumption expenditure of workers employed in the other two sectors. But what capitalists in the wage-goods sector gain in profit is offset, in aggregate, by what capitalists in the other two sectors have to pay in higher wages. For capitalists as a whole, the initial effects cancel out. Note, however, that there is an assumption that the distributional change in favor of workers does not provoke an immediate negative investment response. As Kalecki points out, if capitalists did cut back investment, this would alter the initial impact of the wage increase. Kalecki, for his part, contends that an initial reduction in investment is unlikely. He reasons that the level of investment planned for the current period will, on the whole, already be set, based on orders for investment goods that have been placed prior to the distributional change. This relates to the lags between initial investment decisions, the placement of investment orders and the time it takes to produce the investment goods and arrange final delivery. In Kalecki’s view, the level of (current-period) production in the investment-goods sector will, to a large degree, already have been determined by prior decisions to invest and place investment orders. Even if there is time for investment orders to be canceled in response to the wage increase, it is not entirely clear that they will be. If demand for investment goods is understood to be a derived demand (derived, at least ultimately, from the production requirements of firms in the consumption-goods sectors, of which the wage-goods sector is the largest), then it seems at least plausible that investment will not be negatively affected by the distributional change. The stronger demand for worker-consumption goods created by the wage increase may, in due course, induce a rise in demand for investment goods, and, as profits increase, a subsequent additional demand for luxury goods. The ultimate effect may be an increase in both consumption and investment. Of course, relative prices would likely change as well to spread the impact on profitability more broadly across the three departments of the economy. Whatever Marx’s view, if investment is understood to be a derived demand, it seems at least possible to conceive of a process in which the ongoing adjustment of wage-goods production to the consumption demand of workers requires additional investment sufficient to maintain planned margins of spare capacity. In the argument developed so far, the possibility of growth alongside high wages has been depicted as resting crucially on the initial response of private investment to the distributional change. Although Kalecki’s temporal argument, highlighting the effect of lags, is plausible, it might be that capitalists anticipate the distributional change in advance, or simply fear such a change and have these fears confirmed. If so, their response might be other than benign, and the impact of the global wage increase indeterminate. The role of government expenditure, in this context, seems key. By adding to demand without directly adding to private-sector productive capacity, government expenditure promotes fuller utilization of capacity. A currency-issuing government can always ensure that its expenditure consistently grows at a pace sufficient to support income growth appropriate to the economy’s capacity to respond at more or less stable prices. This, combined with lower marginal propensities to leak to taxes and saving associated with the distributional shift in favor of workers, can encourage growth. Provided government persistently plays this role, a period of weak private investment (perhaps due to capitalists attempting an ‘investment strike’ in protest over the wage increase) will result in gradually mounting rates of capacity utilization until, at some point, adjusting output to demand will require installation of additional capacity. Although the rate of profit associated with any given rate of capacity utilization will be lower than before the global wage increase, the capitalists’ hand may actually be forced at this point. Failing to expand capacity when demand warrants it will mean missing out on potential profit. At least within a competitive setting – in which firms face active competitors as well as the threat of new entrants joining the industry – it can also mean losing market share to rivals. It may be that capitalists try very hard to prevent a distributional shift in favor of workers, but once a universal wage increase goes through, will not cut off their noses to spite their faces. If low profit rates are all that are on offer, then low profit rates are what capitalists will compete over. No doubt, in the meantime, they will do everything in their power to undo the distributional change through political and industrial means. The period from the end of the Second World War until the present may offer some historical support for this idea. 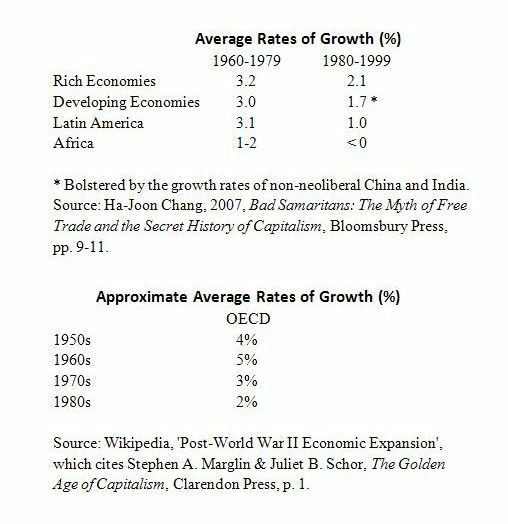 Although workers won some important concessions after the Great Depression and again after the Second World War, growth rates in many countries were relatively strong in the immediate postwar period. Gradually – and increasingly so in the neoliberal period to follow – capitalists were able to wrest back their ascendancy in the class struggle and, with the aid of compliant governments, dismantle some of the concessions previously granted to workers. The foregoing discussion suggests a significant role for fiscal policy in promoting economic growth. In particular, it highlights the relevance of government expenditure as a major source of ongoing autonomous demand that does not directly create private-sector productive capacity. A government that spends a fairly stable and sizable proportion of GDP, and steps up this spending in absolute terms over time broadly in line with a feasible rate of economic growth, will do a lot to induce other expenditure, both private consumption and private investment. Other institutions promoting stability in social relations. Since consumption out of wages is relatively stable, whereas private investment behavior is more volatile, institutions and regulations that prevent a free-fall in wages help to provide a somewhat stable demand support to the system. Despite the presence of exogenous stabilizing influences, however, capitalism as a whole is always prone to instability. Cyclical behavior, even if around a rising trend, is to a degree unavoidable because of the role and effects of private investment within a capitalist economy. Put simply, when extra investment is called for, because of above-normal capacity utilization, the investment expenditure adds further to demand at a time when overall demand is already strong, while adding to capacity only after a time lag. The effect is temporarily to push demand nearer to, and possibly beyond, practical capacity limits. 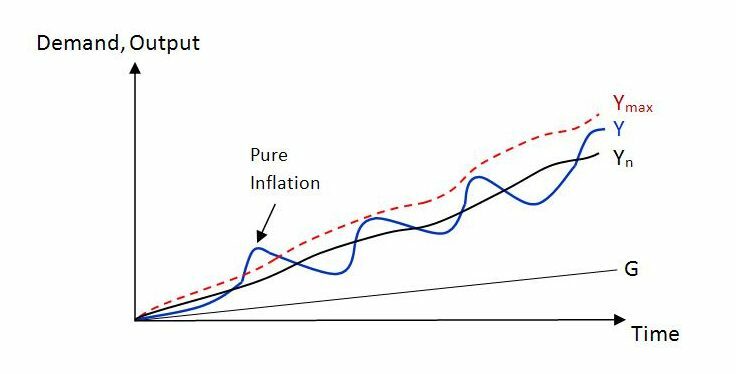 As a result, there can be some pure inflation (in which prices inflate away demand that cannot physically be met with an expansion of production). Then, once the additional capacity has been installed, private investment, and therefore overall demand and the utilization rate, will suddenly drop off. In this way, the economy will typically oscillate around a trend, where the trend is determined by non-capacity-generating autonomous demand – most notably government expenditure – and the fluctuations are due to the demand and capacity effects of investment. A very stylized representation of this process is shown in the diagram. Government expenditure G – taken for simplicity to be the only form of non-capacity-generating autonomous demand – is intentionally stepped up at a constant rate over time. Assuming, again for simplicity, that there is no change in the propensities to leak to taxes and saving, the government expenditure has a stable multiplier effect in which private consumption expenditure is induced. When output Y is pushed beyond normal, implying a capacity utilization rate greater than 1, private investment is induced as firms attempt to restore the normal degree of planned spare capacity. It is supposed that so long as actual output remains below the absolute maximum possible, the general price level can be taken as given, but that if demand pushes actual output beyond this point, prices will rise to inflate away the difference. Alternatively, there could be some non-price rationing. Once the additional capacity is installed, investment falls away for a time, and this has a negative impact on overall demand, causing actual output temporarily to fall below normal. However, if the government continues to step up its spending at a steady pace consistent with the intended rate of growth of real output, this along with the consumption expenditure it induces will once again push actual output toward and then beyond normal. And so on. We have seen in the period leading up to the global financial crisis of 2007 that others can also attempt to be the source of non-capacity-generating autonomous demand when governments fall down on the job. But this other source – private autonomous consumption expenditure financed through private credit creation – is not a sustainable means of maintaining healthy growth in autonomous demand and, via the multiplier (and supermultiplier), economic growth. The process hits its limit when debt-servicing requirements go beyond the capacity of consumers to pay out of income. For a currency-issuing government, it is different, because it faces no revenue constraint. Finance capital can extract higher interest from private debtors than from currency-issuing governments. Any payment of interest by a currency-issuing government is purely at its own discretion, and can be zero (e.g. employing overt monetary financing or zero interest on reserves) if so desired. Capitalists prefer it when workers are docile and compliant. Private indebtedness helps to keep them so. The political opposition to growth induced by government expenditure rather than private consumer debt underscores the need for grassroots efforts capable of pushing government policy in a more desirable direction. I don’t think I’ve said thank you for putting these pieces up. They are very useful summaries and a ‘goto’ resource. Peter, I am going to write some random thoughts here. Ignore if you want…. Self-powered (carrying their own motive power) machines are the dominant feature of our current and recent history, a bulldozer or a combine harvester and a single operator can do the work that used to take dozens of men with shovels or scythes. This productivity boost is nearly entirely because of the fuel, rather than the bulldozer or the combine harvester. Sure the machine “does the job”, but if the fuel tank is empty, it is not a machine, it is useless; also fuel is needed to build the machine, from extracting ores to making them into into a machine shape. The equivalent story for older economies was that serfs were the motive power or “fuel” of shovels and scythes: without their motive power the shovel and scythe are essentially useless, and could not be constructed. So the labor-content theory of value really should be considered the *fuel/energy content theory of value*, because all value-adding involves “transformation” and that is only possible by means of the application of powered tools by consuming energy. Whether transformation is powered by human labor. animal labor, or by fuel or both is not important, what matters is the energy expended. A rich person is not so much one who owns “productive capital”, but one that can command a large amount of human or animal labor OR fuel to power a profitable (value adding) transformation. The value of that “productive capital” *as such* is in essence the embodiment of the the energy used in building it. Therefore surplus is produced entirely by energy/fuel, whether it be by labor or chemical, and the “natural price” is the quantity of energy necessary to produce across all stages of production a good or services, while the market price is that paid by those who don’t have ready access to the energy required for that, and thus have to pay “retail”. The difference between natural and market price is then essentially, for industrial goods and services, the outcome of arbitrage between wholesale and retail energy price. Put another way what matters is not the labor time content of goods and services, but the energy content; the labor time is just a special case based on assuming an average power output per worker per time unit, and in an economy where most transformations are powered by human-labor instead of some other energy. This line of reasoning vindicates the notion that productive capital does not produce any surplus/value-added/profit, only “labor time” that is energy invested does: because “productive capital” is entirely the outcome of the application of energy, and only has value inasmuch it can be fueled by labor, petrol, or other source of energy. But is also suggests that surplus belong with the supplier of energy, which is not necessarily a laborer, it can be the owners of any supply of fuel. I am essentially making a distinction between laborers as “people” that is as “souls” :-), and their *bodies* as sources of motive power. The latter also help understand why randian and marxian theory are so fundamentally similar. For Marx laborers become brutalized by alienation into being beasts who only supply motive power, as “human batteries” that power the machines owned by capitalists for mere subsistence wages, designed just to allow them to “recharge” their motive power, thus exploited by the capitalist who confiscates all the surplus created with that motive power. For Rand laborers *are* beasts who can at most supply only motive power being at best “human batteries”, and if they earn anything above subsistence wages who allow them to recharge their motive power it is because they brutalize capitalists extorting the surplus only the capitalists produce, because the laborer’s motive power does not create anything new. There is a fundamental difference between AIs and people, constantly repeated in the movies, and missed by most viewers: the life of the AIs is driven by “purpose” (the necessity of capitalist system), the life of the people is driven by “choice”. The war between AIs and people ends when the AIs and the people start coming together thanks to Neo, who is of both phyla, and the example is in the final scene of the trilogy the little “indian girl” AI who learns the ability to escape “purpose” by exercising “choice” because she is the fruit of “love”. Thus was social democracy born. I don’t want to pre-empt Peter’s own answer, but, for what it might be worth, let me say this. Firstly, I sympathise with your attempt. I do believe the law of value — although energy never appears explicitly — has implicitly plenty to do with energy, but it also has to do with time (and I don’t see you writing about time anywhere). How do you know that the productivity boost is nearly entirely due to fuel, rather than the bulldozer or the combine harvester? Can one find data — figures, numbers, charts — showing that? I would be surprised that data existed and you point to the reason yourself: if the fuel tank is empty, it is not a machine, it is useless. (1) The reciprocal of that is true, as well: if there is no machine, it is the fuel tank that is useless. (2) What about the machine operator? In other words, both machines and fuel/energy are equally needed: one fails, the other fails. This means one cannot single one out as you seem to do. Makes sense? Another reason I sympathise with your argument is because some Sraffians stumbled with a similar problem. You just need to add “energy” to Wolff’s list of inputs (i.e. iron, corn, cloth). Perhaps the definition of labor value is incomplete, if by linear algebra anything true about labor value is true about iron value or corn value. To put it differently, if some assertion one is expressing about X-values in some restricted language L come out “the same” whether X is labor, iron or corn, then this is evidence that L cannot express essential features of labor that distinguish it from iron and corn. Outside of L is should be able to say, fine, if all economic propositions I can prove about labor are true for iron or corn, then let the iron or corn do all the work. We don’t need human labor to establish any economic proposition. if all economic propositions I can prove about labor are true for iron or corn, then let the iron or corn do all the work. We don’t need human labor to establish any economic proposition. One could advance the same objection to energy: if energy is the source of value, then let energy do all the work. We can go home and watch TV, which is clearly absurd. As I.M. Flaud also writes: the (Sraffian) definition of labor value is incomplete. In other words, if one represents labour exactly as one does iron, corn, cloth, or energy (as Wolff did initially and as many Sraffians still do), then one finds that each and everyone of those inputs are equally capable of producing a surplus, which is absurd. Energy can produce a surplus, so can labour, so can corn (Sraffians love “corn”), so can iron. This is because one is representing a worker like a small businessman producing “labour”, just like a farmer is a businessman producing corn (Sraffians love “corn”), or a coal miner is a businessman producing coal (energy). Therefore, one needs to add something extra to represent labour properly, to avoid the absurd. The representation of labour is incomplete (as I.M. Flaud said). Read Prof. Wolff’s posts and check his PDF articles. Although I’m a bit disappointed by his politics, he writes well and is always entertaining and clear. I think if the focus is on a normative conception of value, the emphasis on energy in general makes sense. Marx’s theory of value is a positive theory. It is a theory that socially necessary labor time is what actually determines value under capitalist commodity exchange – not necessarily what should determine value. This is viewing value from the perspective of a person or firm. Not only that, but it is viewing value from the perspective of a person or firm that, for systemic reasons, is thinking and acting in a small-minded way. They are acting in the kind of unenlightened self-interested way that capitalism – via competitive imperatives – tends to compel. To the extent that this unenlightened self-interested behavior is not compelled, it is because we choose (e.g. through government measures) to alter the ‘rules of the game’ and the relative rewards for various activities. Marx’s theory provides insight, as do some other theories, into why capitalist societies tend to damage the environment. Firms only take account of the social and environmental costs of production to the extent that they themselves incur these costs. They ignore broader costs to society or the environment. Competition requires them to ignore these costs unless rivals are also compelled (e.g. through taxes or penalties) to pay them. From a normative perspective, capitalist society undervalues natural resources. In other words, I think a full-energy approach to value probably does have a lot of merit in determining how we should go about valuing goods and services. But it will take not-for-profit actions (e.g. through government) for this to become actual. It may also require systemic change. In principle, it can be done within a tightly regulated capitalism. The difficulty is that capitalism tends to encourage small-minded self-interested behavior, so it tends to reproduce political opposition to progressive change. And the opposition continues to push back hard when anything progressive is momentarily put in place. I always feel slightly perturbed when I hear ‘labor-content theory of value’. I can never quite understand why, but I know it has something to do with the human factor. From one pov, a human being is an energy unit – using mental, emotional and physical energy, to manipulate the same outside of him (her) self. This according to their ‘values’ which are constantly changing throughout childhood and adulthood (teenagers are totally insane for awhile)! A lot of ‘values’ are not even our own: – they are simply conditioned societal track hurdles we accepted, without even questioning them – ‘a few golden balls rolled through the world and most people chase them’. And so we have a winner! I have seen people dying, gasping their last few breaths, and their ‘value’ at that time was just please, one more breath. Not in command of anything – and unfortunately not in command of themselves. That only happens when the heart is full of gratitude I have noticed. So the first thing I have to do is take away what I feel is mistakenly applied: – a notion of universality in value, on the outside, for a human being. ‘Labor’ then, is an externalised notion, applied only within a certain context along with a temporal value. Old-world Zulus will pound a Rolls Royce into spearheads; world views may conflict. So, in the human sense energy is central; and the other side of this coin is the dynamic nature of human ‘value’. Here the words ‘desire’ (attracting something to oneself) and ‘purpose’ (manipulating energy) comes to mind. What actually fulfils a human being remains a mystery to most. And yet the ‘values’ of this world are never questioned. Time for me, is a river, into which eventually, everything is thrown. It’s also a Librarian who conscientiously puts everything back in its place. But it seems true that within the Labor-context all inputs have their influence; but then all inputs are the children of energy expenditure. I had to laugh when I read Adam Smith’s notion of ‘toil and trouble’. I still think the ‘value’ is in the human being as first cause; then because of that he will generate the energy to covet what he thinks will benefit him in some way and fulfil this value. And who will be the judge of that – as long as he does no harm. Life is a progression from value to value in that sense. But anyway, I notice the idea of ‘value’ is skipped over very quickly in economics or assigned to something on the outside, and I don’t know whether that is entirely a good thing. Has this blog discussed Tony Atkinson’s 15 proposals of public policy?